The Kenya Vision 2030 is the national development blueprint starting 2008 to 2030, developed following on the successful implementation of the Economic Recovery Strategy for Wealth and employment Creation which saw the country’s economy back on the path to rapid growth since 2002. The 2030 goal for urban areas is to achieve “a well-housed population living in an environmentally-secure urban environment.” The vision envisages that change will be achieved by bringing basic infrastructure and services—roads, street lights, water and sanitation facilities, storm water drains, footpaths, and others—to informal settlements. The Kenya government’s Medium-Term Plan 2008–2013, which presents the first five-year program to implement the Vision 2030, also specifies improving urban informal settlements as a priority. This vision is particularly shared by the urban poor living in over 300 informal settlements across the republic. Informal communities have begun to inspire one another of how best in their own small ways they can “change” their spaces to accommodate upgrading due to the in dignified status quo of urban informality and selective planning discourse. One such case study is the Kiandutu Informal Settlement in Thika of the larger Kiambu County. Kiandutu informal settlement is located in the outskirts of Thika Town, 40 kilometres North West of Nairobi city. The settlement is located on 94 square kilometres of land that was public land held in trust by the then Thika Municipal Council, now Kiambu County Government. Portions of the land have since been hived off and allocated to private developers. The community has however held on to possession of the land. Just a like the Chronicles of genesis, Kiandutu has had its own journey and story. In 2011/2012, the community albeit not well organised in a unique communal structure, the people embraced enumerations and GIS Mapping of the settlement, as a key mobilisation and organising tool. The process was supported jointly by Muungano wa Wanavijiji and Muungano Support Trust. Data gathered established a population of 17,000 people in approximately 9800 households. The settlement is divided into 8 clusters. And the residents have organized into 15 saving groups spread across the clusters. The groups form a well cultured network and are legally registered jointly as, Kiandutu Community Based Organisation. The savings groups have a total membership of over 951 members. In the period August 2013 to December 2013, the groups had a total daily savings of USD 12,000. In a jointed spirit the communities subscribing in the ideals of the federation of the urban poor, the groups have put up a community hall, which is a centre of convergence for the network and youth groups in the settlement. Under the federation’s house improvement project, the settlement has undertaken house improvements for 30 of the poorest families. One of the key elements identified in the Enumeration Report depicting Kiandutu, is the issue of safe water access and sanitation. Issues of Sanitation became a strong pact between the community and the federation to find means and ways of alleviating this sorry state of affairs in Kiandutu. The sanitation project was thereafter pitched by SDI President Jockin Arpathum in November 2013 when he visited Kiandutu. It is envisioned as an incremental strategy to achieve security of land tenure for the Kiandutu community. Informal settlements may be as a result of low income, unrealistic urban planning, inadequate secure tenure among the poor, and lack of serviced land, lack of social housing, and a dysfunctional legal and justice systems. The settlements develop over time and some have existed for decades, often becoming part of the regular development of the city, and therefore gaining rights, although usually lacking formal titles. Whether they are established on public or private land, they develop irregularly and often do not have critical public services such as sanitation, resulting in health and environmental hazards. Understanding the challenges and opportunities of existing and future informal settlements, and how upgrading can be an effective policy to address informality in different contexts is a significant aspect of addressing this urban challenge. The next key step is to analyze the key design aspects of an upgrading intervention, including how to: plan and finance an upgrading project; improve infrastructure and shelter in informal settlements; regularize land; address the social dimensions of upgrading; and sustain improvements, while learning from real cases and the experiences of practitioners. This therefore empowers slum dwellers to apply the knowledge and skills gained into the design of their own upgrading projects. Simultaneous to the Kiandutu sanitation project is a settlement-wide planning process. The planning is undertaken through an urban planning studio exercise jointly conducted by the University of Nairobi and Muungano Support Trust under the auspices of collaborative partnership between Slum Dwellers International (SDI) and the African Association of Planning Schools (AAPS). This is aimed not only as a way to create the planning framework for situating the sanitation project, but also as a lead in to future land regulation and house upgrading initiatives. The proposed sanitation blocks forms a basis for an Urban Studio with the University of Nairobi, AAPS and Muungano/MuST. Whist the studio is themed Sanitation; the technical expertise in the team is supporting the community to develop a layout/blueprint for the future implementation of a housing upgrade. The opportunity for this community to be involved in the construction opens new frontiers for skill training and development for youth, women and men in all the components of this development. New skills on systems, financial management, masonry, material sourcing and management and also engagements with various levels of government. The resolve by the community of Kiandutu to regularize the land tenure is a call for security of over 17000 people who call the settlement HOME. The sanitation process is a strategy towards tenure for these poor families. The impact on women’s ability to access safer and cleaner facilities will largely contribute to an increase in general hygienic households. New skills on systems, financial management, masonry, material sourcing and management and also engagements with various levels of government. The community currently runs a housing improvement fund with very clear and open financial systems that are drawn from exchanges to Kambi Motto Housing Site. The toilet facilities will increase the capacity of the savings schemes to manage the fund. Government waiver on approval process cost. The Community led planning processes has opened up opportunities for the community to consider gradual upgrading through reblocking and actual housing construction. Ongoing discussions with SDI to assist in the development of a settlement design that enables the vision of the Kiandutu families to be interpreted while negotiating for the grand settlement tenure with state. Development of a savings capturing and management system has enabled individual and group monitoring of savings which is replicable to the national level. The toilet construction has so far mobilized women to reflect on the insecurity of the settlement. 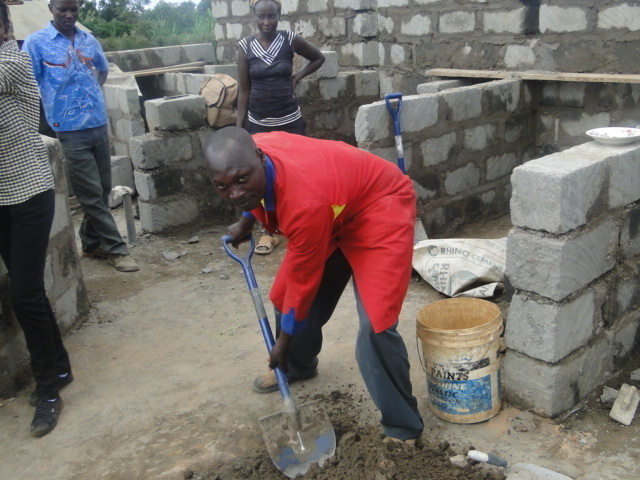 With more traction created by the community sanitation block.